Now that the weather is finally warmer, I can not begin to tell you how this excites me. With school ending next month, those busy late nights of cooking dinner in the kitchen, and hustling to get everything done in a day’s time, will be a thing of the past. With Summer beginning soon, the excitement is only building up in this household. Oh yes, those lazy summer days are almost upon us and you know what? One of the things that are a must and is so helpful to me during Spring and Summer is preparing quick and easy to make recipes. I truly don’t believe there is not a mom who doesn’t. I believe that most of the time we just want to kick back like the rest and enjoy that deserved extra time. But when you have a family of 5 with different appetites it can make it stressful to think of ideas on what to serve. My family loves when I’m creating one bowl meals and you know what? Who am I to pass judgment, it does save this mom time in the kitchen so it’s a win-win for me. 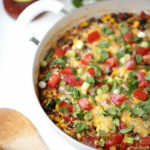 Today I thought it would be fun to share some of our favourite one pot meals. 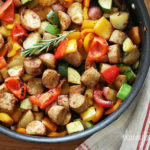 Summer Vegetables with Sausage and Potatoes by Skinnytaste. You can swap out the summer veggies for whatever happens to be in season for a year round treat. 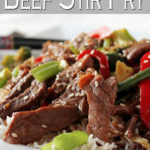 Vegetable Beef Stir Fry by Dishes and Dust Bunnies. Grab some chop sticks and whip up this stir fry dish for a fun family meal. One Pot Burrito Bowls by I Heart Naptime. Mexican inspired food is a go-to for families and these burrito bowls are sure to be a crowd-pleaser. 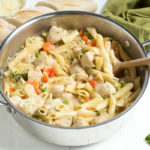 One Pot Creamy Chicken and Vegetable Pasta by recipe girl is a meal that both kids and adults will love! 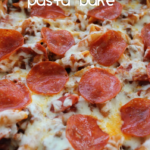 One Pot Pepperoni Pizza Pasta Bake by raining hot coupons This casserole recipe is a one pot recipe and very kid friendly. If you are a fan of pizza recipes or cheesy recipes, you will love it! 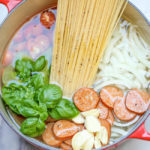 One Pot Pasta by Damn Delicious The easiest, most amazing pasta you will ever make. Even the pasta gets cooked right in the pot. How easy is that?! 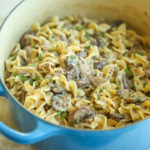 Beef stroganoff by Damn Delicious made completely from scratch in ONE POT in less than 30 min. And it tastes 10000x better than the boxed stuff! 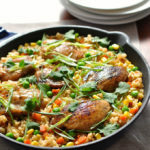 One Pot Chinese Chicken Fried Rice by RecipeTin Eats An all in one dish that combines the savoury taste of Asian flavoured chicken with kid-friendly fried rice. 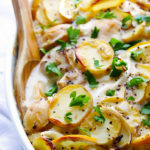 Lemon Chicken Potato Casserole by Gimme Some Oven An easy, creamy and delicious casserole that makes good use of condensed cans of cream soup if you’ve got them at the ready. 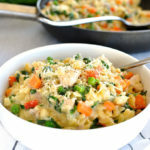 One Pot Creamy Chicken Vegetable Orzo by RecipeTin Eats A take on one pot pasta except made with orzo which cooks faster and results in a less starchier sauce than pasta. A tasty well-balanced meal to feed the kids that’s loaded with veggies and protein. 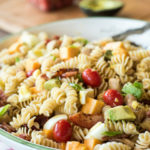 Cobb Pasta salad by Nutritious eats Traditional Cobb salad meets pasta in this protein-packed one dish meal. 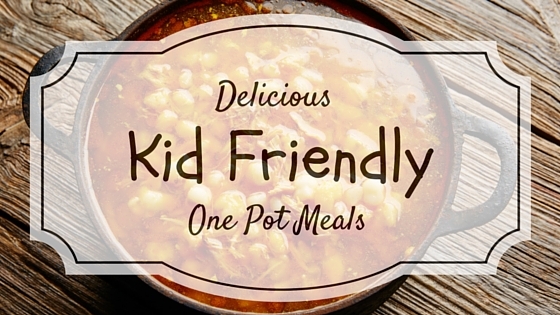 It’s kid-friendly and great for leftovers! Quick Chicken and Dumplings by My recipes This creamy one-dish meal cuts the prep time in half by using flour tortillas instead of homemade dumplings. As always, be sure to click on the links to be taken to the original sources and recipes! Which one is your families favourite? My boy don’t like to eat normal meal. I will try this type of variety for him. Thank you so much for sharing lovely ideas. Wow. You’ve cooked a lot of good meals. I’m also fan of one pot meals. All of your pots look so good. I bet your kids love your dishes a lot. Nice post. Me too! The last thing I need is to be swamped in the kitchen for an hour after we have finished eating dinner! I’m always on the look out for new recipes to try with my kids too so if you have any to share I would love to hear about them! Your dished look so delicious. Ha ha seeing these I wanna sit to have a big meal right now. Hope my kids will feel the same this week when I prepare for them this food. Thank you for nice suggestion. yummy. i’m very busy so i don’t have much time cooking for my kids, their dad often do that, but i think i must spend all this weekend cooking these meals for them. nice post. Yummy! I was searching for something like this, because cooking for little ones is exhausting and I need new ideas! I think the burrito bowls would be the biggest hit for my family. I want to try one of pot meals. They look delicous. It is nice ideals for them. OMG! SO many delicious recipes! My hubby and kids love chicken. 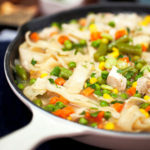 One Pot Creamy Chicken and Vegetable Pasta looks good. I will give it a try. I absolutely love one pot meals. Only one pot to wash and they come together so quickly. Thanks for the round up! Great meal ideas for the summer, especially the One-Pot burrito bowls. The chicken friend rice looks simple enough also! I love one pot meals. Especially if they are kid friendly, which in my house means “husband” friendly because he’s a picky eater, not my kids. This is a wonderful roundup. I started getting obsessed with one pot meals in the spring, and managed to make a few pasta ones for the kids. I’d love to add more dishes to this fun culinary adventure! You’ve pretty well got me covered for a month of cooking here. I love one pot meals! Me too! With summer just around the corner I want to spend time outside enjoying myself not dealing with sudsy water. Oh yes, girl! My crock-pot gets a work out all the time. My family loves pot roast in the slow cooker and when I add potatoes and carrots, it becomes a one-pot meal! Thanks for your list! When you have children sometimes you don’t want to be in the kitchen all day or night. Meals that are easy to prepare are just what we moms are looking for. One pot meals are awesome! So many good ideas! I love chicken and dumplings. Love it! My son is a picky eater! I can’t wait to try them! Great selection of recipes! I for anything made in one pot! Ok, this all looks sooo good! I am always looking for new ideas for dinners and there are some great options here. Thanks! Lots of yummy dishes here adn i am all for a one pot meal. My favorite would have to be chicken pot pie.